Like it or not, most high school boys' varsity teams believe they can beat just about any womens' team that challenges them, even if it's the greatest women players in the world. Call it sexist, call it what you will, but there's a little Bobby Riggs in most of us. In its quest for gold, the U.S. Olympic Women's Ice Hockey Team, currently ranked No. 1 globally, accepted that challenge, taking on a series of prep varsity boys' hockey teams over the past couple months in order to prepare for the 2014 Winter Olympics in Sochi, Russia. So, how have the women fared? Well, mixed results, actually. They required an overtime glove save and sudden-death goal to defeat U.S. Olympic Women's coach Katey Stone's alma mater, The Taft School in Watertown, Mass., 2-1. You can watch the game here. A week later back in November, the U.S. women lost to Salisbury (Conn.) School, 3-1. Granted, we don't know the level of effort put forth on both sides — even Salisbury's press release states, "The focus was not on winning or losing" — but somebody kept score. Regardless, the women bounced back with a 5-2 victory against Saint Sebastian's School in Needham, Mass. Now, Dexter Southfield School (Brookline, Mass.) stands in the way of a winning record with only a few weeks before the Olympics begin in early February. They're schedule to face off against in each other in the Boston area on Sunday. 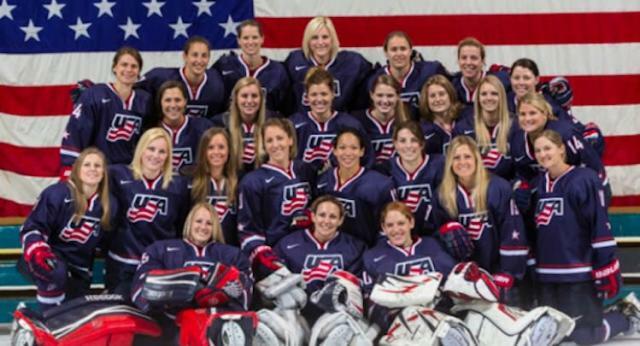 The U.S. Olympic Women's Ice Hockey Team trains around Boston, as most of the players have ties to the Northeast. Six (Kacey Bellamy, Alex Carpenter, Kendall Coyne, Meghan Duggan, Michelle Picard, Molly Schaus) attended prep school in Massachusetts and another three (Julie Chu, Hilary Knight, Josephine Pucci) in Connecticut, playing for the girls' varsity teams in the same private school leagues they're scrimmaging against now. Just imagine what the boys from Salisbury will be saying when the women win gold. Ben Rohrbach is a contributor for Prep Rally on Yahoo Sports. Have a tip? Email him at preprallyblog@yahoo.com or follow Prep Rally on Twitter!